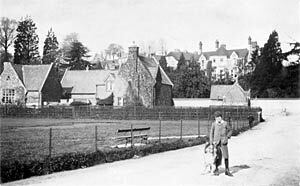 Before Station Road was built, people from Exwick had to travel two and a half miles via Exe Bridge to reach St David's Station. In addition, the three mills in Exwick were disadvantaged by the distance from the station, when transporting paper, flour, grain and wool by rail. James Wentworth Buller who owned much of the land and property in Exwick knew that a road linking Exwick with Red Cow and St David's Station would be advantageous to his tenants. As chairman of the Great Western Railway he was able to insist that traffic could cross the railway line, if the River Exe and the leat were bridged. In 1851, Buller persuaded the Bristol and Exeter Railway to donate £150 towards building two bridges – this, plus money raised by subscription from the mill owners and other interested parties, raised about half the money required to build the bridges. Buller made up the shortfall himself and in 1851 two wooden bridges were built, one over the leat and one over the Exe. A private road from St Andrew's Road to the bridges, across his land was cut and the road opened to the public. In 1855 tolls were imposed, to be collected at the toll house; Buller allowed the 'labouring classes' to pass along the road for free and a board at the toll house stated "Private Road - No passing without payment of toll, excepting for foot passengers." The toll house had a bar across the road to ensure that traffic stopped, but the occasional dispute over payment was reported in the Flying Post. Mr Edward Palmer, a poor 71 year old was killed, in 1860, attempting to cross the thirteen railway lines, while pushing a wheel barrow. He "was knocked down by some loaded trucks which were being shunted... three trucks passed over his shoulder and head, and when he was released he was quite dead." The Bristol and Exeter wanted to close the crossing, but were overruled. A year later, the bridge over the leat was replaced with a more substantial structure using iron-girders and masonry at a cost of £270. In 1866, the remaining wooden bridge over the river was badly damaged by floods and by 1870 in poor condition – it was rebuilt in 1871 at a cost of £1,200 in cast iron and stone. Station Road as it is now known was adopted by the City Council in September 1901, and the collection of tolls was stopped. See toll house for a description of the day. 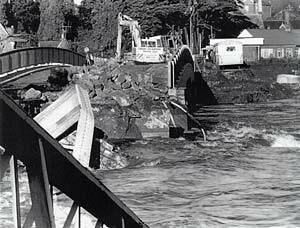 In September 1974, before the concrete bridge over the flood channel was completed, a torrent of water swept down the Exe and carried away the old bridge, which had been installed by the Bullers more than a century before. The next day, the Exmouth Coastguard was called to fire a rocket, with a line attached, across the river so Post Office Engineers could reconnect 600 telephones in Exwick. A temporary pedestrian bridge was installed, before a new bridge was opened in 1976. See Station Road Bridge for more on the bridge. In 1988, the toll house was the last of the Buller property in Exwick to be sold by the family, and it is now a very small private house. During 2008 the Environment agency built a flood wall above the children's playground on the corner of Station Road – they also built a facing wall on the opposite side of Station Road. The gap between the two walls has facilities to fit a temporary flood barrier to protect Exwick if the flood channel is overwhelmed by the expected one in a hundred years flood event. Sources: Various papers from the Buller archive at the Devon Records Office and the Flying Post. The small toll house in Station Road can be seen behind the hedge. The remains of Exwick bridge in 1974. Courtesy the Express and Echo.